MDE was formed in 1990 “to improve the quality of life for all those in Markethill and the surrounding district through economic, social and environmental projects”, to run parallel to and in harmony with Markethill District Community Project Ltd (1988-1998) — an Action for Community Employment (A.C.E.) scheme providing re-training and employment. Widely supported on a genuine cross community basis by local people from various backgrounds with a wide range of skills, interests and talents, around 250 people attended the launch in Gosford House Hotel. Assisted and encouraged new and emerging community groups in local hamlets and villages such as Clady, Glenanne, Loughgilly and Mountnorris resulting in a positive long term legacy of environmental improvements, play schools and the GLM village hall in Mountnorris. Helped in the formation of several interest and focus groups in Markethill. Other achievements include the building of the attractive roundabout in The Square, making 80% of the shops wheelchair friendly, new street lighting, new paving, seats, town water pump complemented by the planting of trees and flowers. 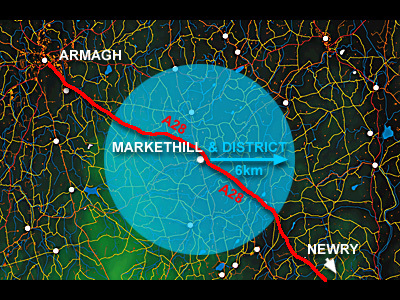 A Rural Towns Development scheme run in conjunction with Keady and Tandragee provided both main entrances to the town with metal sculptures of 3cows and a calf by Ulster artist Kevin Killen depicting our original ‘Market on The Hill’. Helped create Markethill Business Centre, 18 work units and offices. MDE became a limited company on 31.08.1997. Purchased derelict Johnston House, exposed the original stonework and extended it for community office or shop use. 1997 purchased, restored and extended the dilapidated former District Courthouse (which had replaced the original town courthouse — currently the C.of I. Chapel of Ease) at a cost of £894,000.00. The Old Courthouse is now a ‘Community Centre’ and ‘Neutral venue’ and is the home of MDE, Future Kids Daycare Facility and the Courtrooms Restaurant. Christmas Activities — Santa Claus. Reindeer — switching on Christmas Tree Lights, Magic Show, Mr. Tayto, gifts, bands, choirs, community singing — all provided f.o.c. ‘Other Users’ include 6 agricultural groups and organisations, 5 schools and colleges, councils, SHSC, Vintage Club, concerts, family parties and receptions. The Old Courthouse is Markethill’s “Tourist Information Centre”. A double-sided tourist information map/plan at the entrance gate. All tourism literature displayed in the vestibule. “Bygones and Byways — an £89,000 multimedia, touch-screen project and facility commissioned at the start of this century providing digital access to our distant and recent history. Currently this is undergoing an upgrade by Adrian Mallon Multimedia and will be relaunched in early-2014.